Jess Mencer Peláez ’05* doesn’t scare easily. 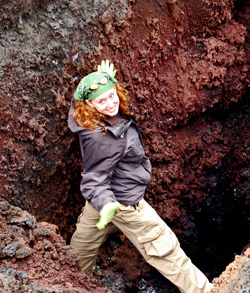 She’s a geologist with a specialty in volcanology and is currently working with a company that specializes in mine-planning software. She has scaled Andean peaks, been chased by Mexican drug traffickers during a geologic exploration, piloted submersibles to the ocean floor, and poked active lava flows with a stick. But this August she’ll tackle something that could qualify as her biggest adventure yet: She will be among 35 racers in the Mongol Derby, billed as the longest, toughest horse race in the world. The 10-day race covers 621 miles (1,000 kilometers) of varied and challenging terrain, and Peláez is not at all deterred by the warning from the Adventurists, the group who sponsors the derby, alerting riders that severe injury and death are distinct possibilities. “This might be either a blessing or a curse, or a bit of both, but I don’t get afraid of things,” says Peláez. She’s been kicked and thrown by horses, and has had her head stepped on and ribs cracked. Still, her voice doesn’t register even an ounce of trepidation when talking about her upcoming journey. “The bigger the challenge for me, the more excited I get,” she says. Here, Peláez shares a few details about the upcoming race. What inspired you to sign up for the Mongol Derby? Isn’t it costly to participate, about $10,000? Yes, more or less. You can self-fund or you can get sponsorship. My husband and I have both made sacrifices and choices with our careers that allow us to continue paying off our student loans so we could help finance this. Do you know any of the other riders? No, and that’s part of the fun. It’s a disparate group from countries all over the world. Do you travel in groups? Everyone starts off at the same time, and you have to change horses every 40 kilometers. You will find yourself among the other riders as you wait for the veterinarians at the urtuus (stations) to check your horse and ensure that its respiration rate and heart rate return to a normal level. At night, everyone has to stop. Where you really make progress is during the day; it’s dependent on how good a navigator and route planner you are. Isn’t riding dependent on developing a relationship with the horse? One thing that will help me with the race is my experience on the Smith equestrian team. I competed in the open division and had great success. Sue Payne [senior coach of riding] was a magnificent coach. For competitions, horses’ names were drawn out of a hat. You got only a couple of minutes to gauge your horse’s strengths and weaknesses and work your style to accommodate them. The race also raises funds for charity. The Mercy Corps is the charity chosen by the Adventurists. The Mercy Corps in Mongolia helps local people have sustainable businesses, provides education, and supports small farmers. I’m also supporting Sueños, which means dreams in Spanish, a charity founded by a veterinarian friend. The organization helps with the pet overpopulation problem that is pervasive in many Latin America countries. They provide spaying, neutering, and animal vaccinations. What makes you an adventurer? A large part of it has to be attributed to my parents. They were both FBI agents. My mom was a terrorism expert and was one of the first women in the FBI, and my dad did work in cybercrime. My life motto has been anything worth doing is generally difficult. Disrupting the continuum of everyday life is often when we find the real purpose of things. How do you pack for the Mongol Derby? We are only allowed five kilos (not more than about 12 pounds). I’ve got the interesting challenge of being a vegetarian, and the food supplied by locals is largely meat-based, so I’m still wondering about this myself. I’ve got to take a GPS. I will probably have an ace bandage or two, some Ibuprofen, electrolytes, and a picture of my husband. How has Smith contributed to your approach to life? 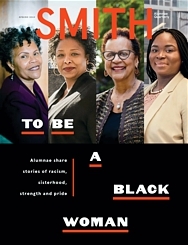 Smith helped show me that opportunities to go out and make something of ourselves need not be limited to anything—and that you are never going to do anything spectacular by sitting at home. * Follow Peláez on the trail in August by visiting her website, where she plans to post updates.